I’ve had countless requests for this recipe so I had to finally buckle down and give the masses what they want. 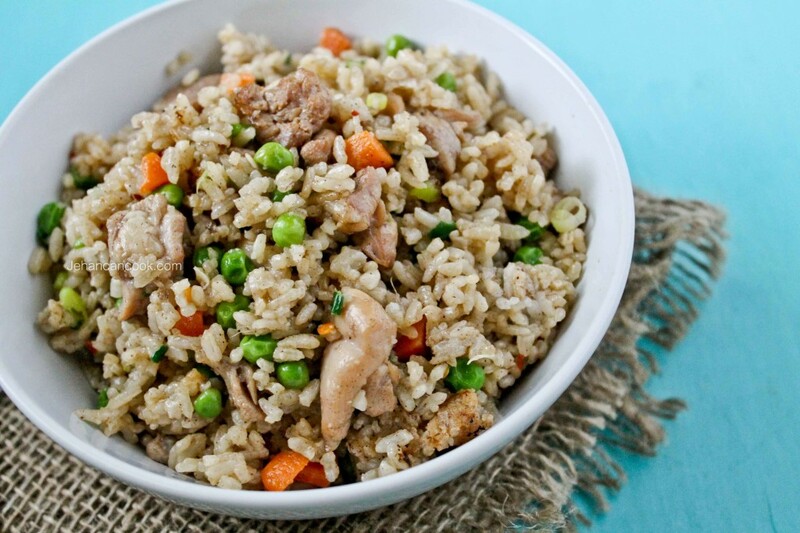 Truth is fried rice isn’t in my usually rotation of dishes that I make for for family; it’s more of a special occasion meal but I would do anything for you guys! I mean who doesn’t love fried rice? It’s quick, simple and delicous. 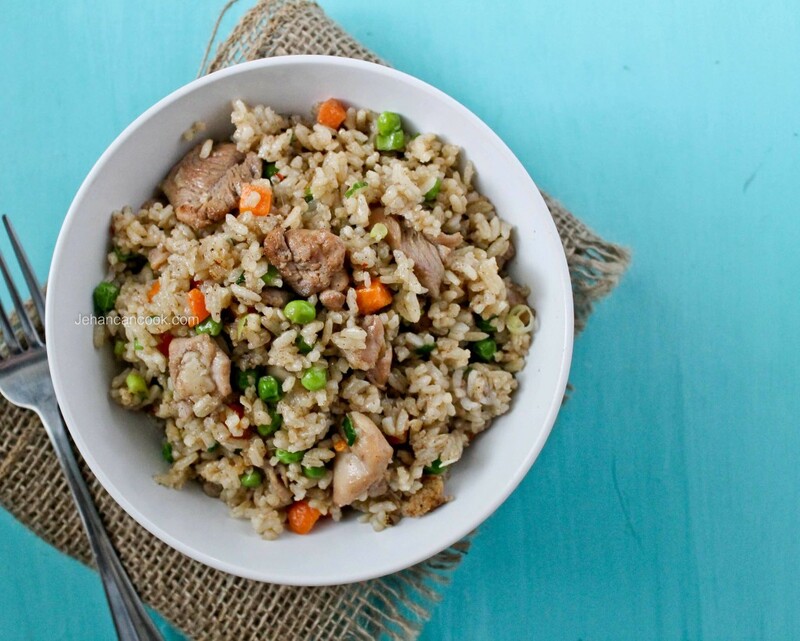 There are a few steps that are important to follow when making fried rice. Make sure to prep all ingredients before you start the cooking because once the cooking process has started you won’t have time to stop and chop anything! Next is to make sure the rice is cold. If you’re using freshly cooked rice, simply spread it out on a baking sheet and allow to cool completely before using. It is also important to under cook the rice just a tad bit, this prevents it from becoming mushy in the cooking process. 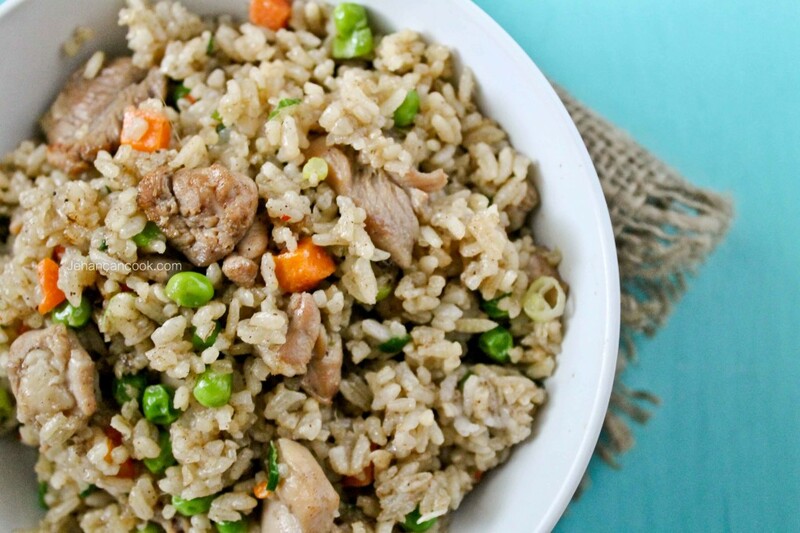 Follow these simple tips and you will be a master at fried rice. Now enjoy! Place chicken in a bowl with garlic, ginger, red pepper flakes, hoisin sauce, 5 spice powder, soy sauce and salt. Next spread rice on a baking sheet and sprinkle soy sauce and 5 spice powder and mix with a fork. In a wok or high heat add 2 tbsp canola oil and sesame oil. When oil is hot add chicken and stir-fry for 2-3 minutes. Add carrots and peas and stir-fry for 2 minutes. Next add 1 tsp ginger, 1 tbsp garlic and rice then stir-fry for 3 minutes. Remove from heat and sprinkle with scallion. Serve warm. It is ok to cook the rice the same day, just make sure the rice is completely cold and undercooked just a bit. Prep all of the ingredients before starting the cooking process because once you start cooking you won’t have time to stop and cut anything as it’s a fairly quick process. Thank you Jehan! Looks delicious, will definitely give it a try. Question I noticed you have garlic and ginger quantities listed twice, 1tsp crushed garlic + 1/2 tsp crushed garlic towards the top and 1tbsp garlic + 1 tsp ginger at the bottom. Is this intentional? Amazing, we both cook our chicken fried rice the same exact way! Yummy!! Great minds think alike Shelly. Hi Natasha, yes it was intentional. I seasoned the chicken with some of the garlic and ginger, and saved some to add directly to the rice when stir frying it. Where does one find five spice powder? Melly, you should be able to find 5 spice powder at the Asian markets or Guyanese grocery stores. Love a good plate or bowl of fried rice. Christine, there’s no sugar in this recipe but feel free to add 1 tbsp of sugar but the addition of the hoisin sauce add a bit of a sweetness to the meat. The chinken fried rice tase so good i try it.